George Graham Reviews Calaveras' "Gren Girl"
Folk trios have been around for a long time, going back to the Kingston Trio and Peter, Paul & Mary. In more recent times, we have had such groups as Girlyman, and We're About Nine. This time we have a new recording by a fairly long-running San Francisco area trio called Calaveras. Their CD is titled Green Girl. Like their contemporary counterparts, Calaveras is co-ed with Greg Beattie and Victoria Blythe sharing lead vocal duties, and Dave Decker on lead acoustic guitar and backing vocals. Beattie is also heard on guitar, while Ms. Blythe plays fiddle and viola, as well as some guitar. Their focus is on all-original music. Their bio says that they have been working on the material for some ten years -- the time since their last studio release. In the meantime, they have accumulated some recognition, including a New Folk Music award at the Kerrville Folk Festival. Their music has also been used in films and television. By their band photo, it's clear that Calaveras is not a group of early 20-somethings, and they write about some things that people of a certain age might be thinking about. In addition to the expected love songs, there's one piece about seeing one's son off to college. Unlike many of the folks groups over the years, Calaveras are not much into vocal harmonies: their music is essentially a series of singer-songwriter type material with one vocalist at a time being the primary focus, perhaps because not many songs are collaborative efforts in the writing. But the results are first rate. The music ranges from traditional-style folk to more energetic rock-influenced tracks, though featuring acoustic instruments throughout. This is not strictly a trio album. Calaveras are joined by a number of other musicians on their CD, including Joe Craven, the percussionist from the David Grisman Group, along with bassist Sam Bevan and drummer Jim Norris on a few tracks. 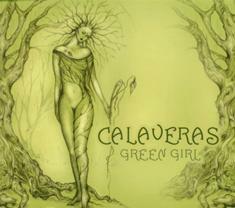 Green Girl the new CD from the Bay area trio Calaveras, is a worthy album by a group that carries on the tradition of the folk trio, but adds their own approach. In a way, it's more a pair of singer-songwriters with an acoustic backup band, than a harmony-singing trio like the old days of folk music. Lyrically, they may not be the most thought-provoking or Bard-like in their crafting of language, but they do write from a different perspective than many on the scene, especially the younger generation. The musicianship is classy, and the arrangements are very appropriate for the music. We'll give the CD a sonic grade of "A," without reservation. The vocals and acoustic instruments are clean and warm, and the CD has a very good dynamic range. It was refreshingly not subjected to the heavy compression that befalls most contemporary pop CDs in the current endless and mindless loudness wars. The Calaveras band was named after a small river that flows into the San Francisco Bay, and which also comes from the Spanish for "skulls." I'm not sure what relevance that has to the recording at hand, but it adds a further interesting detail to an outstanding CD that adds a nice spin to the classic folk trio setting.